HEARST TOWER: We'll start at the northern reach of the area, at the corner of Eighth and 57th. From 1928 on, William Randolph Hearst and his minions commanded the news magnate's empire from this former six-story Joseph Urban building, now a mere shell used to prop up Sir Norman Foster 46-story glass jungle gym. THE WINDEMERE: (above) It's still there, for now, at the corner of 57th and Ninth Avenue, despite the malignant efforts of its negligent landlord, Masako Yamagata, to allow the 127-year-old building to fall in a heap of dust. 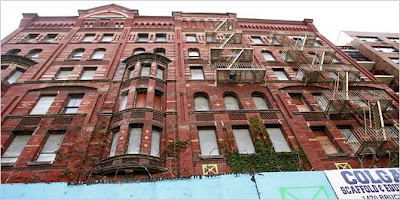 The Romanesque Revival structure is one of the oldest large apartment houses still standing in Manhattan. S. WOLF PAINT: Walk down Ninth to 52nd. Here is a big Benjamin Moore paint store. Peek around the corner and you'll see another storefront to the L-shaped building bearing the sign S. Wolf. That's what the store used to be, when old Simon Wolf, and later son Stephen, commanded the New York paint biz from this perch during most of the 20th century. Stephen's son, Matt Wolf, is a well known London theatre critic, which goes to show how far from the tree the apple can fall. TOUT VA BIEN: Walk to 51st between Eighth and Ninth. Sixty years old and still basically the same, this old-school French bistro acts as if the neighborhood has never changed from the days when the visiting French fleet used to make it their home away from home. DRUIDS: Walk to Tenth Avenue. Near 50th is Druids, a nice, dark, atmospheric bar that's been there for a decade or more. It was once the incongruously titled Sunbrite Bar, a haunt of the murderous Westies gang. LANDMARK TAVERN: Walk to 11th Avenue and 46th. This 1868 building has always been a restaurant and bar. It once looked onto the lapping shores of the Hudson. It's owned by the same guy who runs Druids, who apparently has a thing for old Hell's Kitchen saloons. 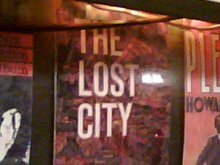 The upstairs rooms are where the original owner raised his family and where, during Prohibition, there was a speakeasy. MARKET DINER: Walk down to 43rd Street. This diner, a favorite of cabbies and other working stiffs, almost died last year, but then reopened in December. A victory for budget-conscious eater and lovers of diner architecture. MANHATTAN PLAZA: Walk along 43rd to Ninth. On the southwest corner stands this tall residence, built in 1977, the nondescript facade of which belies the colorful characters of its inhabitants. If you don't like actors and showfolk, don't step inside. Half of working-class Broadway lives here. WESTWAY DINER: Look across the street at one of the last places where the starving actors in the neighborhood can get a cheap meal, and at any hour of the day, too. Cops like it, too. 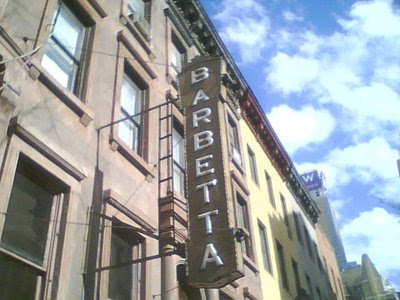 Supposedly, the idea for "Seinfeld" was hatched here. But I think a lot of ideas have been hatched here. 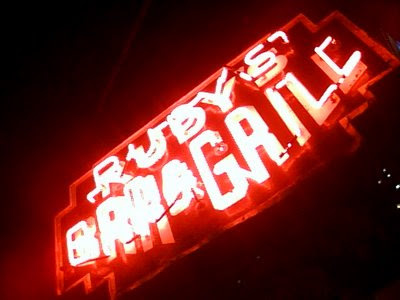 RUDY'S BAR AND GRILL: Walk up a block on Ninth, between 44th and 45th. Free hot dogs. Big statue of a pig outside. Duct tape on the well-worn red booths. Barflies aplenty. Everyone knows this place, right? 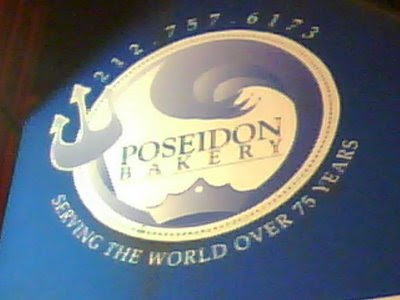 POSEIDON GREEK BAKERY: Just next door to the raffish Rudy's is this dignified, longstanding family bakery, purveyors of Greek delicacies and old-style service. It's been around 89 years. FILM CENTER BUILDING: Across the street is this landmarked Art Deco building. A hundred fascinating showbiz related outfits do work inside. BRUNO RAVIOLI: On the next block north of this amazing section of Ninth is this 103-year-old maker of great pasta. MAZZELLA'S MARKET: Between 47th and 48th, this half-inside, half-outside market gets my vote for the most purely old-New-York-ish business in Hell's Kitchen. The place, which sells both wholesale and retail, has done an impeccable job of ignoring every bit of modernity that surrounds it. All that's needed is a pushcart to complete the picture. RESTAURANT ROW: Jog back to 46th and walk the block between Ninth and Eighth. As long as anyone can remember, people starring in plays and people going to plays have eaten at restaurants lining this street. Among the most lasting is BARBETTA, more than 100 years old and with only two owners, the father and daughter of the same family. Among the most storied is JOE ALLEN, named after its crusty owner, who once dated Chita Rivera and who also owns Orso and Bar Centrale next door. THE CAMELOT: Walk down a block to 45th. This apartment building was built in the 1960s and was named after the popular musical. I just like the fussy lettering on the side of the building. THE WHITBY: Walk west on 45th. This sweetly old-fashioned apartment complex was built in 1934 as a residential hotel, and has a surprisingly starry history. The Andrews Sisters Doris Day, Joe DiMaggio, Charlie Chaplin and Betty Grable have all lived here. Somewhere on the south side of this block, at what was Billy Haas’s Chophouse, on Aug. 6, 1930, Judge Joseph Force Crater left the restaurant, stepped into a cab, and was never seen again. "But I think a lot of ideas have been hatched here." Westies! Excellent tour. I went up there a few months ago looking for old Westies haunts, anything. Most everything is gone, though a few old delis and storefronts survive. Famous story about Druids / Sunbrite - Jimmy Coonan I think bringing in a head in a bowling bag (the story was adapted by Lawrence block for his character Mick Ballou - rolling the head down the bar. Also Jimmy Armstrongs - Jimmy's dead now for 8 years or so and last time there the joint had changed for the worst to just another pub. Jimmy did 10 or 15 years for murder. t been back in a long time and now Hell's Kitchen is a rich neighborhood. I have so many memories of the old Hell's Kitchen. I am an original Hell's Kitchen B*tch, and always will be, no matter where I live! I intimately know most of the places listed. Thank you for bringing back good memories. I lived my childhood at 421 W. 57th, then later at 315 (mid '60's to mid '70's). My babysitters were from the Cooney family who lived on the fourth floor of The Windemere. I remember the tiny, old rickety elevator that took FOREVER to go a few floors, when it was working that is. Also their kitchen sometimes had a tilted floor because the building would sometimes shift on its foundation. But as run down as the building was, I remember its interior well, and the great softboiled egg cup that Mr.Cooney would make for me when I was there. My old babysitter Kathleen lives in Ireland and I'm in Oklahoma, but 57th between 8th and 10th is the street I grew up on and I'm glad the Cooney's old building still stands. Although it was in horrendous condition when i last visited in 2011, it remains while so many other neighborhood spots I remember are long gone (Woolworth's, Horn & Hardart, the NY Colosseum, and my old school St. Paul the Apostle). I was a horse-drawn carriage driver in the early 1970s and the stable I worked out of was on 38th street between 10th and 11th. Had a lot of meals at the Market Diner and the Munson Diner. 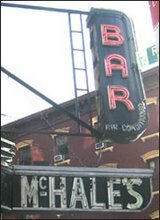 The drivers used to hang out at a great bar called The Sports Corner on 38th and 10th Ave (which I assume, like the Munson Diner, is long gone) ... I remember several dead bodies turning up on the railroad tracks and lots of speculation that the Westies were involved, and possibly the Mafia as well. The stable was owned by the brother of Albert Anastasia. It was a very intense, very crazy time. I used to work as a pressmen at the NYT on 43rd, remember Goughs very well. It had decent food, simple and good. I can still remember the picture in the center of the bar against the mirror of John L Sullivan. That place was a legend, sad to see it gone. I miss walking to PS 111 from 49th street between 10th and 11th in the 70's.